Yesterday evening was one of those evenings which made me feel so joyful and blessed to be doing what I do in this great city. The soiree started off with dinner for four at Mayes Oyster House on Polk Street with the formidable Los Angeles-based composer Morten Lauridsen, the poet, head of arts and culture programs for the Aspen Institute and former Chairman of the National Endowment for the Arts, Dana Gioia, and Tamsin Smith, the founder of Slipstream, an ethical business incubator based in San Francisco. The conversation grooved around such topics as poetry, music, architecture and whether oysters really taste like waves when you slurp them. The prize for the most memorable lines of the evening went hands down to Mr. Gioia: "Critics with musical backgrounds are best equipped to understand and write about my poetry" / "The BBC called about wanting to make a documentary about me. I declined because I thought it would give me just enough notoriety to receive more emails from strange people but not enough notoriety to be able to afford a secretary." 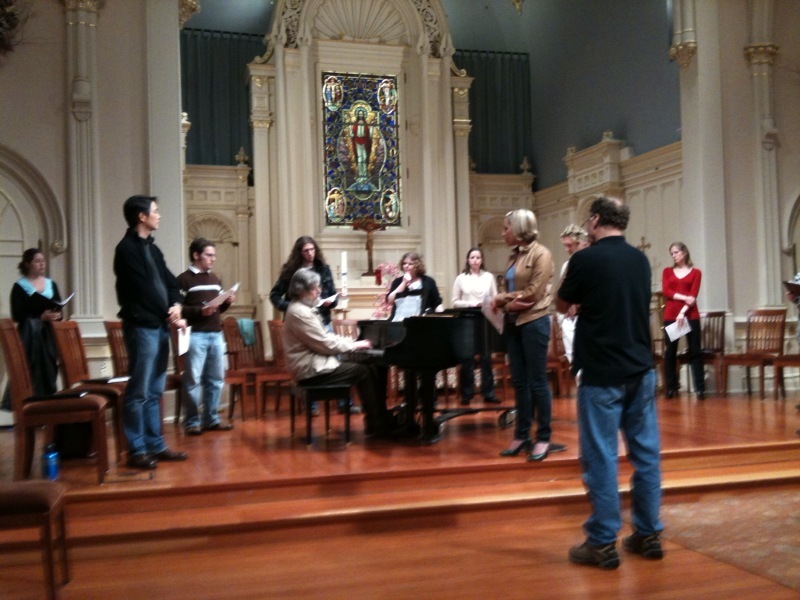 Dinner was followed by a trip to St. Mark's Church where I was thrilled to catch the local choral ensemble Volti rehearsing some works by Morten for a pair of concerts this weekend. It was amazing to watch the singers' body language change as they sang the gorgeous "O Magnum Mysterium," perhaps the composer's most well-known piece. Their bodies went from being rigid to supple. Their faces relaxed. It was like watching the musical equivalent of deep-tissue massage happening right before my eyes. Morten seemed so excited to be in the rehearsal room with the choir, a group with which he has collaborated on several occasions in the past. He leapt about like a sprite. It was wonderful to see him play the piano (see the snapshot I took, above) -- the composer is accompanying the singers in a performance of his "Nocturnes" at this weekend's concerts. It was hard work tearing myself away from the church before the rehearsal was over, but I had to get to Davies Symphony Hall for the opening night of the Los Angeles Philharmonic's national tour -- the orchestra's first national tour in nearly a decade and its inaugural tour with its rockstar music director, Gustavo Dudamel. I was assigned to cover the concert for the Los Angeles Times. The event distinctly lacked the glamor of the LA Phil's opening night concert at the Walt Disney Concert Hall last October, though the program was the same -- the orchestra performed John Adams' "City Noir" and Mahler's First Symphony. Unlike their counterparts down south, concertgoers in San Francisco don't know how to dress and have no sense of occasion. But the music was mostly divine and Dudamel made a huge impression (as always) on the audience. I got some good material for my story, including interviews with Adler Fellows Leah Crocetto and David Lomeli (who sang the Verdi Requiem with Dudamel in LA last November). Then I hot-footed it back to base to file an article and blog item to the LA Times to meet an overnight deadline. Staggered to bed at around 2 a.m., tired but blissfully happy. I feel like the luckiest gal alive.